There are certain writers, certain people I continue to come back to because they stand alone. Cliche, of course, that we're all different but some are different from the different because they've taken peelers to their souls and exposed what most are afraid to even think about. Monique Doyle Spencer is one of these, whom I was lucky enough to meet a couple of years ago. She's funny and she writes about stuff that is so unfunny that you can't believe you're laughing. Monique and her new book, How Can I Help? Everyday Ways to Help Your Loved Ones Live with Cancer, are subjects of a long, affecting feature by Liz Cooney in today's Worcester Telegram, "Being There." Read it. Monique's first book, The Courage Muscle: A Chicken's Guide to Living with Breast Cancer, is a side-splitter about breast cancer; this one needs to be put in the hands of those around people with cancer. ...Somehow the words become a mocking shadow of their intended message. I need many things, but nothing you can offer me. I need many things, but you have to be here with me when I need them. I need many things, but I didn’t know what I needed until you were long gone. A warm and caring expression leads me to despair. 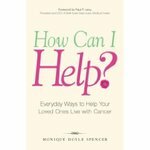 ...Monique Doyle Spencer helps us understand that the kindest words in the world can impart unintended cruelty if we are not attuned to the mental and physical state of our friend with cancer. But she also knows that we are not cruel, that we are kind and caring and really want to be helpful to our friend in need. In the pages that follow she teaches us how to do this. And order the book, multiple copies and carpet the friendship networks of everyone you know with it. Again, the link.